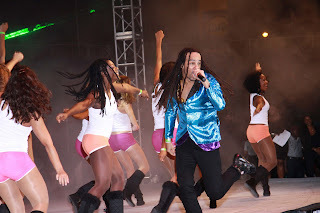 Soca music, as indicated by one of my current favorite songs above, has been the theme for this past week. 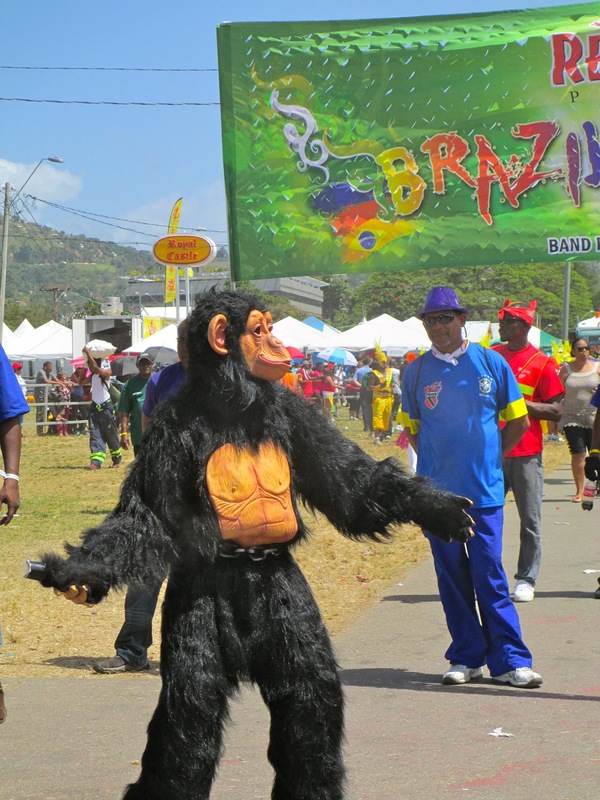 The Carnival festivities began bright and early on Friday, with the Dragon Festival and steel pan drums dominating town all day [see last post]! 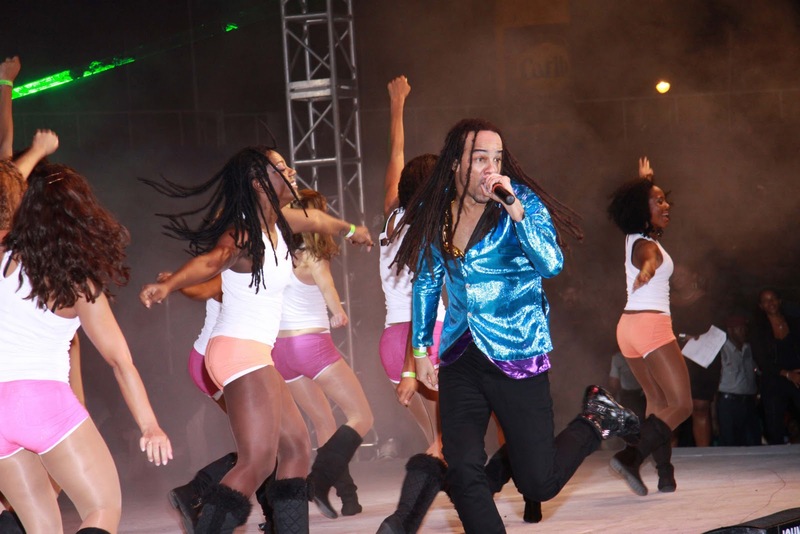 As the sun dipped below the horizon, the preparations began for International Soca Monarch, an annual competition held on Carnival Friday (it's Fantastic Friday!). This soca frenzy began around 9PM and lasted until 4AM. I have yet to develop the party stamina here! 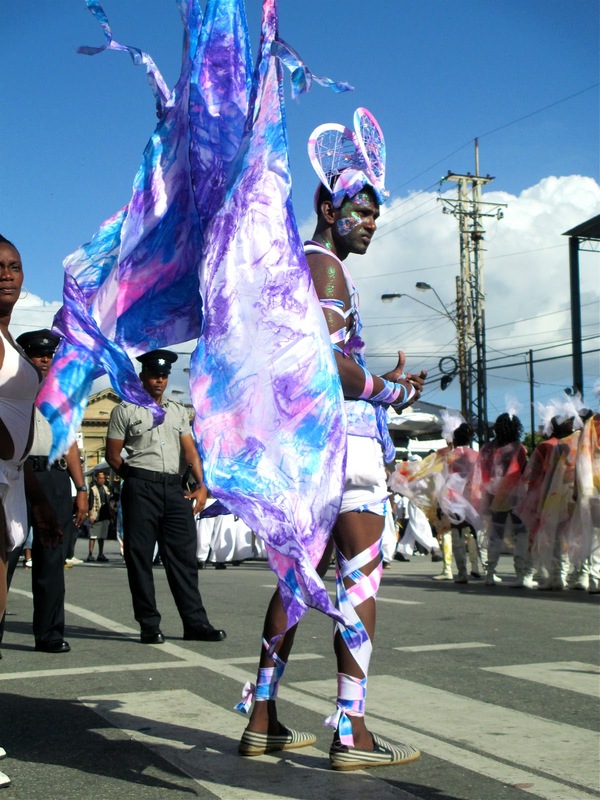 J'Ouvert, a French word for "daybreak", is the high-energy festival that officially begins the Carnival festivities. 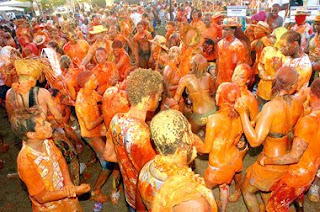 It begins with the first revelers parading in the streets, dancing to carefree soca, and throwing paint in all directions in the earliest hours of Monday morning. Bands ride on trucks with large speakers, blasting their music into the sunrise, with their hoards of dancers "chipping" in matching costumes. Oil and mud are often used in addition to paint. These materials, opaquing people from head to toe, add to the feeling of freedom and anonymity in the dark hours of early sunrise. Time moves in a different way as you dance your way through the streets, collecting all the colors of the rainbow. While some people ventured out on Monday to watch the parades in Port of Spain, Trinidad, I recovered from a night without sleep. Monday is the day when the bands are focused upon, while Tuesday is the day of beautiful costumes, performances, and music! After the sun set, the parades ended and the crowds merged to become one with the costumed dancers. As darkness fell, everyone threw their hands in the air and entered the streets for an unforgettable city-wide dance party into the late hours of the night! Carnival has been a period of amazement and the removal of some misconceptions. I lost track of time in the pursuit of enjoyment. 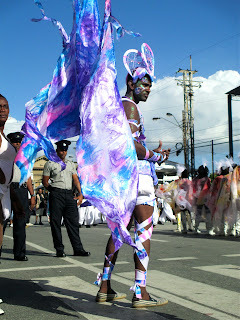 I truly began to understand some of the beautiful traditions in Trinidad and Tobago! I would return to celebrate these days in a heartbeat.